This is an old revision of this page, as edited by WyattSalazar at 06:58, 10 August 2014. It may differ significantly from the current revision. "World War 2 in a fantasy land, from the perspective of fantasy soviets." The 18th of the Aster’s Gloom in 2030 was a day the Ayvartan people would never forget. 23 years after toppling an oppressive empire and instituting a socialist government that returned rights and dignity to the workers and peasants, the Ayvartans found themselves again at war. Overseas, the revolution they took pride in was seen as a bloody coup against a legitimate government and a subversion of the people’s true will — and the Nocht Federation, the Kingdom of Lubon, and the Empire of Hanwa, together comprising almost half the political power of the world, would not allow the red flag to wave over Solstice any longer. Ideology is stronger and swifter than any ordnance; and in the midst of a world-shattering war, the Ayvartan people will struggle to cope with love, purpose, identity and destiny, as ancient legend, horrific technology and the waning magic of the world are thrown into a titanic clash. The Solstice War is a serial fiction with notes of action, adventure, fantasy, socialism, military fiction, queer literature, and a World War II aesthetic. The Solstice War has not been tagged yet. 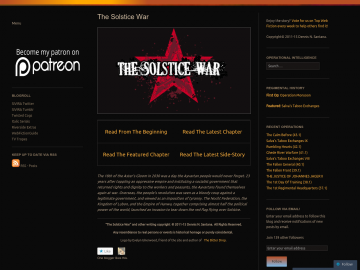 Help others find The Solstice War by tagging it! The Solstice War has not been reviewed yet. The Solstice War has not been recommended yet.